According to South Korea’s Chosun.com, 150,000 medical and support personnel of the Chinese People’s Liberation Army have been mobilized along the Yalu River that separates North Korea from China. 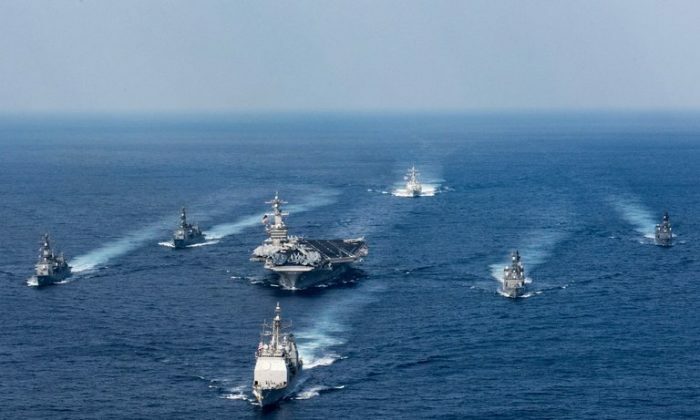 The reported deployment shortly after an American carrier group headed by the USS Carl Vinson started towards the Korean Peninsula on April 8, changing course from an original destination in Australia. U.S. President Donald Trump and his Chinese counterpart Xi Jinping recently met in Florida, between April 6 and 8. Both leaders came away from the summit apparently satisfied, and pledged to bring the North Korean nuclear crisis to a peaceful conclusion. And on April 6, Trump ordered a massive cruise missile strike against a Syrian airbase after reports that government forces had used chemical weapons in its ongoing civil war. This has fueled speculation about things to come in Korea. Pyongyang has expressed confidence in its “tremendous military muscle with a nuclear force” to defend itself should the U.S. decide on a military solution. North Korea, a communist dictatorship and one of the most repressive regimes in the world, has taken a menacing stance against its neighbors for decades. In 2006, it exploded a primitive nuclear weapon and has conducted nuclear and rocket tests of increasing sophistication in the years since. On April 10, Trump indicated in a tweet that solving the U.S.-China trade imbalance would work out better for China if they were to cooperate on managing North Korea. Then the President repeated his mantra of going at the problem alone regardless of whether China decides to participate.